Click play to view a demonstration. Silent Running is a high performance coating specifically designed to eliminate unwanted sound and vibration in the marine environment. Silent Running works by converting noise energy and vibrations into a low grade heat, which is then dissipated throughout the applied surface. Silent Running is Coast Guard approved. General Properties: Silent Running is water-based, non-toxic and VOC free. There are no harsh smells or vapors. Silent Running cleans up with water before it cures. Adhesion: Silent Running is designed as a 'permanent' coating. The product has excellent adhesion to all metal, fiberglass, wood and most plastic surfaces. Proprietary components are added as 'adhesion promoters' to help ensure its permanent adhesion. Adhesion is not affected by extreme cold or heat. Silent Running can withstand temperatures from -30°F to 250°F. Durability: Although Silent Running dries to a hard surface, it retains excellent elongation. Silent Running will not chip or crack with any flexing, expanding or bending of the substrate. 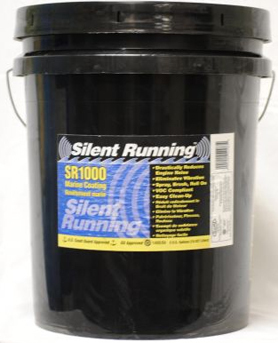 Silent Running cures virtually waterproof and is extremely resistant to gas, oil and many chemicals. Flammability: Silent Running is non-flammable. Should the product come into contact with flame, it is self-extinguishing. Safety: Because of its water-based formula, Silent Running meets or exceeds all environmental standards and is 100% non-toxic. Application: Silent Running applies faster and easier and penetrates where other traditional methods of sound dampening cannot.